In Parkholme (Fleetwood) ownership. Did not fish from Fleetwood. 26.10.1926: The board of Kingston Steam Trawling Co Ltd decided to build four more distant water trawlers to the same design as the four built by Cook, Welton & Gemmell Ltd (SARDIUS, TOURMALINE, KINGSTON DIAMOND AND KINGSTON PEARL). Contracts were signed with the shipyard to build the ships at a cost of £9,125 each and with C. D. Holmes & Co Ltd to make the engines and boilers at £6,300 each unit. Total cost £15,425 per vessel. The names chosen for the new vessels were KINGSTON GARNET, KINGSTON EMERALD, KINGSTON TOPAZ and KINGSTON ONYX. 18.6.1927: Launched by Cook, Welton & Gemmell Ltd, Beverley (Yd.No.488) for Kingston Steam Trawling Co Ltd, Hull as KINGSTON ONYX. 5.8.1927: Registered at Hull (H365). 11.8.1927: Completed trials and accepted (John W. Lown, manager). 15.8.1927: Sailed on first Icelandic trip. 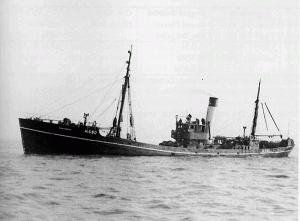 19.8.1927: Held up by Danish Fishery Cruiser FYALL when steaming from Westerman Islands to Cape Reykanes. 5.9.1927: Landed 818 kits grossed £921. 20.4.1937: Sailed Hull for Middlesbrough to be lengthened. 6.1937: Completed lengthening by Smith’s Dock Co Ltd, Middlesbrough to 151.5 feet (including fitting new bow and stern sections). Re measured 357g 151n. Total cost £4,290. 12.7.1937: Re-registered at Hull on lengthening and tonnage change. 11.1938: Boiler fitted with superheaters by C. D. Holmes & Co Ltd, Hull. 21.8.1939: Admiralty telegram to withdraw all vessels from White Sea, Bear Island and Norway Coast. 26.8.1939: Ordered to return from sea for requisitioning. 31.8.1939: Requisitioned for war service as a patrol vessel (P.No.4.54) (Hire rate £174.10.8d/month). 1.6.1940: At Sheerness fitting out as an Armed Boarding Vessel (Lt. J.B. Wright RNR). 25.12.1940: Arrived Kirkwall (Lt. J.B. Wright RNR). 6.1940: Northern Patrol (Lt. R. Walgate RNR). 7.1941: Based Granton with A/S Group 13 (Sk. E. J. Day RNR). 27.7.1944: Arrived St. Andrew’s dock, Hull for decommissioning and return to owner. 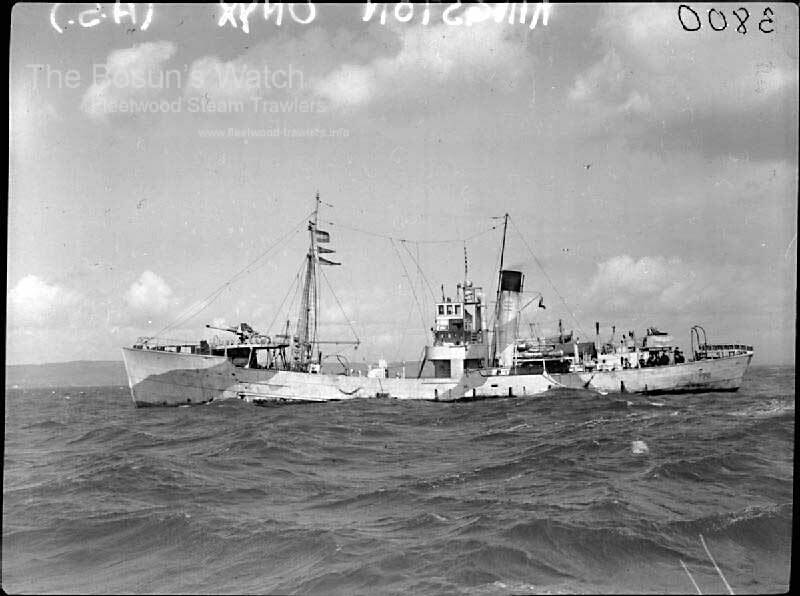 4.12.1944: Sailed Hull for fishing grounds (Sk. Albert Cornish) after refitting for 100 days. 9.10.1945: Sold to Parkholme Trawlers Ltd, Fleetwood (Harvey Wilfred Wilson, Grimsby, manager) in an en bloc sale with CHALCEDONY (H392) for £52,500. 10.1945: Registered at Grimsby (GY119). 18.2.1946: On a Norway Coast trip, responded to call from KINGSTON PEARL (H542) (Sk. J.W. Hornby) badly damaged by heavy seas. Stood by until salvage tug PARAT (191grt/1913) arrived. 4.1946: Registered at Grimsby as MOORSOM (GY119) (Grimsby Industries (Trawler Managers) Ltd, managers). 5.11.1947: Sold to J. C. Llewellin (Trawlers) Ltd, Milford Haven (John Charles Llewellin, manager). Fishing from Hull (Saint Andrew’s Steam Fishing Co Ltd, Hull, managing agents). 1.11.1948: Registered at Hull (H590). 23.9.1948: Registered at Hull as WESTHOPE (H590). 30.7.1954: Sold to Saint Andrew’s Steam Fishing Co Ltd, Hull (B. A. Parkes, manager). 1956: Sold to BISCO and allocated to Clayton & Davie Ltd, Dunston upon Tyne for breaking up. 15.11.1956: Hull registry closed “Broken up”. 10/07/2010: Page published. 8 updates since then. 03/04/2018: Removed FMHT watermarks from images. This entry was posted in Non Fleetwood Vessels, Steam Trawlers, Steamers (Picture) and tagged Parkes, Parkholme Trawlers on July 10, 2010 by Fred Smith.